New Commissioner of Police Jalandhar Gurpreet Singh Bhullar today said that he would accord top priority to solve the untraced cases besides making strenuous efforts for detection and prevention of the crime in city.Interacting with the media persons after assuming the charge of office today, the Commissioner of Police said that solving key untraced cases like Maqsoodan Bomb Blast, murder of mother of an Assistant Inspector General of Police and loot from employee of liquor trader was on top of his agenda. He assured the media persons that these cases would traced very soon as Punjab Police was one of the best forces across the globe.“The Punjab Police has a glorious tradition of serving the country efficaciously and I am confident that upholding this we will get at the bottom of these cases very soon” added Mr. Bhullar. Spelling out his agenda for maintaining law and order in the Commissionerate Police, the Commissioner of Police said that due focus would be given on categorization of criminals and their surveillance in an effective manner. Likewise, he said that tirade against drugs would be further intensified and thrust would be made to completely wipe out this curse from the Commissionerate.Mr. Bhullar also said that concerted efforts would be further made to solve the traffic problem in the city and the entire traffic management plan of the Commissionerate Police would be reviewed.Similarly, the Commissioner of Police said that PCR would be made more responsive to deal with any sort of urgency. He said that Public dealing at the Police stations would be further made better for which Police officers would be made accountable. Mr. Bhullar also said that adequate focus would be laid on good, responsive and transparent Policing for which feedback would be taken from the general public and the press, which was the fourth pillar of every democratic system.The Commissioner of Police also announced that new initiatives would be taken to ensure the well being of the Police force and their family members. He also said that thrust would also be laid on ensuring the security of senior citizens in the city. Mr. Bhullar said that as it was just the beginning and he would study all the crucial issues faced by the city and ensure its timely resolution.Earlier, the Commissioner of Police took salute from guard of honor given by the Punjab Police on reaching the office. 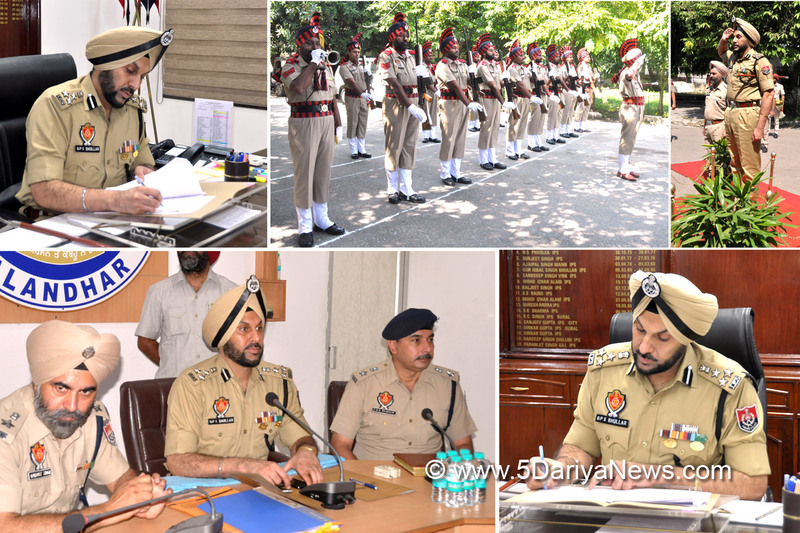 Later he had detailed deliberations with the senior officers and Station House Officers of the Commissionerate Police.On the occasion Deputy Commissioners of Police Mr. Gurmeet Singh and Mr. PBS Parmar, Additional Deputy Commissioners of Police Ms. D Sudharvizhi, Mr. Sachin Gupta, Mr. KS Heer, Mr. Parminder Singh Bhandall and Mr. Gurmail Singh, Assistant Commissioners of Police Mr. Sarabjit Rai, Mr. Dalbir Singh Buttar, Mr. Balbir Singh, Mr. Navneet Singh Mahal, Mr. Maninder Pal Singh, Mr. Satinder Chadha and others were also present.